Rowaine Lays Hands on Troll's wounds. Arrian's examination of the figurines leads him to believe that they do not have any religious significance. Troll looks over his shoulder, saying that they seem to him to be some sort of magical enhancement device. The party plan to perform a room-by-room search starting on the upper level, before torching the house. The rangers guard downstairs while the others take the stairs up, Arrian checking for traps. The corridor turns right and ends shortly after, with doors leading left and right. Troll Acids yet another hole in the left wall, taking longer than normal as a result of the matriarch's dying curse. Through the hole they see a number of large and filthy beds with headboards that sport ghastly human skulls decorated with antlers. The windows on the far wall are partially boarded up. Arrian searches the floor and beds for traps, finding nothing but filth. Behind the far bed is a chest sitting against the wall, about 18 inches wide by 12 inches high and deep. It does not have a visible locking mechanism. Arrian checks for traps and finds a suspicious coiled spring hidden in the crack between the chest's base and lid. Arrian asks for the regeneration ring, Troll hands it over and then exits the room with Shalélu. Arrian tries to immobilise the spring as Rowaine stands by. Click, swoosh! A claw-like succession of blades pops out of the chest, catching Arrian's wrist. He feels his hand and forearm begin to sting, but manages to shrug off the poison. After rechecking the chest, Arrian carefully opens the lid. Inside is a layer of sacking. Arrian removes it with the tip of his dagger, revealling a pile of coins (121cp, 110sp, 23gp) interspersed with humanoid fingers. Troll Acids a hole in the other side of the corridor. The space behind is dark and covered in spiderwebs. Troll can just make out crates in the far corner, also covered in webs. Large pots or urns stand on along the left wall. Troll Fiery Bursts the near webs and they shrivel. He cannot hear anything coming from within, but does hear a whipping sound coming from below. "Are you guys OK?" asks Arrian. "Can you hear a whipping sound?" "Yes, it's been doing that for a while." "Yes, I think so, do you want me to go have a look?" asks Vale. "Yes, carefully," says Arrian. "Stay together and check it out." He hears their footsteps walking away. Arrian enters the room, searching for traps, and reaches the corner. Troll clears the webs away from the door with another Fiery Burst. Arrian rounds the corner. The room is in huge disarray. Tools, bones, and all manner of junk litter every surface. Some are embedded in the walls. The return part of the room is stacked full of web-covered crates. Rowaine Detects Evil, sensing none in any direction. Troll looks up and spies more webs but nothing moving. 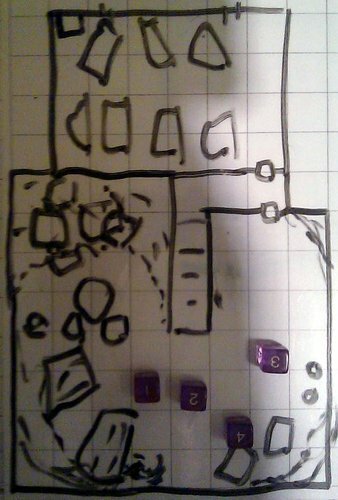 Arrian moves towards the crates opposite the door, searching for traps. The crates appear to have been nailed shut at some point but are no longer. He opens them; they contain odd-shaped pieces of metal. To the right he sees a mass of various sized bones piled on the floor beside oddly matched tables. An assortment of largish rusty tools, nails, makeshift blades and other oddities lie on the tables. More cobwebs obscure the ceiling overhead. "Some sort of workshop?" he muses. He asks Troll to clear the webs at end of the return. Troll clears the left side first, then the right. Several crates start to smoulder, and as elven eyes readjust after the flash of Troll's spell, they can just make out tiny things dropping to the floor. Arrian Creates Water in the form of rainfall over the burning area, dousing the budding fire. Everything is dripping wet. Some webs remain, mostly high in the centre where the roofline peaks. Troll Fiery Bursts again and the webs disappear. He again has a mental image of things floating to the floor. Arrian moves to the crates, searching the floor. Troll moves back and Acids a hole in the wall for another escape route. He hears Kaven's voice yell "Hey! It's moving! It saw me and it's uprooted itself!" Troll hustles down the stairs as Arrian yells "Let's just exit and burn the place!" The rangers are in the crèche. Troll gets Jakardros' attention. "No, it's just moving around the room." Kaven adds that he got to room with the new doors when the creature saw him and started tearing itself out of the ground. Troll can hear the creature's heavy, shambling stride. Boom! Boom! A massive battering noise followed by an unintelligible roar. Troll pokes his head down stairway but sees nothing. Boom! This times the walls shake. Troll makes a hole in the wall leading to the kitchen, then looses a Fiery Burst down the stairway. He directs the rangers forward, left and right to cover any other possible exit points. Shalélu stays with Troll. His Fiery Bursts slowly start burning the open doors downstairs. Troll asks for oil, Rowaine gives him a couple of pints. He splashes them over the floor and walls halfway down the stairs. Boom, smash! Something gives way, followed by the the sound of a slow, shambling stride and groaning, stressed timber framework. The oil is now freely burning. Troll pours Rowaine's last two remaining pints of oil over the floor in the kitchen and dining room. He then grabs chairlegs, wraps drapes around them and hands them out for people to start fires. They quickly take to the task. Troll leaves the building on his Disc and circles, Fiery Bursting the walls all around, hoping to add to the destruction. The cladding does not easily catch, but a few Fiery Bursts through the top level windows quickly start a blaze. After he lands, Shalélu reports fires started in the crèche and kitchen. Outside, the party can faintly hear dogs barking and growling, to the left. Rowaine and Arrian mount up on Harley while Troll, Shalélu and the rangers keep an eye on the burning house, which is now well alight. Troll and Shalélu patrol aerially on the Disc. They can hear/feel the occasional shudder, but whether it is the creature or simply the house falling apart, they cannot tell. Harley plunges through the woods towards the growling and barking. Arrian suggests a fearsome howl, which Rowaine directs Harley to do. The barking continues. Rowaine and Arrian see glimpses of dogs jumping around, not far away. Rowaine stops Harley as they enter a seminatural clearing. Half a dozen dogs circle around a ragged hole. They turn around and launch themselves at the intruders. Arrian casts Prayer and the battle is joined. Rowaine's chops are made with her usual vigour and the battle is over quickly, Arrian sustaining minor damage from a lucky bite. The hole is twenty feet deep and lined with wooden spikes. At the bottom is a woman, barely alive. She looks badly hurt, her clothes torn with portions wrapped around her lower leg that is bent at an unnatural angle. Wrapped around her shoulder, growling, is some sort of reptile. "Who are you?" the woman replies. "We have rescued the Black Arrow rangers held here." "Black Arrows? Well, that's weird. You're not going to kill me?" "Sitting in a hole, bleeding at the moment…"
"I heard a noise and came to investigate, them something chased me and I fell down this hole." "I'm the person who might rescue you, if he feels like it…"
"Well I'd rather take my chances thank you very much." The reptile on her shoulder growls again. It is hard to say whether it is cute or menacing. Arrian catches Rowaine's eye. "Is she evil?" Rowaine walks over and looks down, her eyes widening. "No, but we've met. That's Emily. Emily, are you alright?" She pulls out her rope, hammer and pitons and fixes a rope, then descends into the pit. "Oh my word!" She tends to Emily, Laying Hands upon her wounds. "We need to get her out of this hole, she's badly hurt and has lost a lot of blood. I think she's broken a bone." "Why don't you get Troll?" suggests Arrian. "OK…" She leaves Harley with Arrian. "Rowaine is going to get our friend Troll for help," explains Arrian. "Do you know Troll?" "The elf with personality problems?" "You know Troll! I'm Arrian, by the way." "Emily. What did you say about the Black Arrows?" "They are the rangers in this area. Some were captured, and about to be eaten." "That's where I was headed, to find these Black Arrow rangers that are supposed to be around here. This is my dragon, Blink." "Dragon? It's kind of small…"
"Well, it's sort of a quasi-dragon." Rowaine finds Troll. "Come with me, you're going to have to see this to believe it." "Do I get to go under the ground?" "In a strange manner of speaking, yes…"
Troll and Rowaine return to the pit and see Emily with her dragon. "Hey!" says Troll. "What are you doing down there?" "Long story… Can you get me out of here? I'm kinda parched… Got any water?" Arrian and Rowaine float down on Troll's Disc, stopping short of the spikes. Rowaine moves to Emily's side. "This is probably going to hurt quite a bit…"
Emily is not currently on a spike, but she looks as if she once was and has lifted herself off. She is quite pale. Rowaine and Arrian carefully lift her onto the Disc and Troll levitates it out of the pit. Rowaine hauls herself out of the pit. "Anything more you can do about this leg, Arrian?" she asks. Arrian expertly rebreaks and resets Emily's leg. Emily grits her teeth and bears the pain. Arrian then casts a Cure spell and the nasty redness around her shin clears up immediately. "Thanks," she says. "That was rough. You haven't got any water have you?" Rowaine passes Emily her water flask. Emily and the others spend some time catching up. "After I left," says Emily, "I wanted to find out more about Blink here, so I went back north towards where I'm from. I went all the way up to Capiscia, where I came across a guy who once had a person in his employ that called himself an ex Black Arrow. He supposedly once said that they had pet dragons, and so I thought, well that's the only lead I can find, so I came south. The first place I found where the people knew anything about any Black Arrows was Turtleback Ferry." "Did you go there?" asks Emily. "It's got a really good casino," says Troll. I know! Tell me about it! "I won 140 gold there," Troll adds. "Did you meet the owner?" Arrian's expression becomes serious. "We've lost Enok." "He should be able to find his way back again, he's that kinda guy isn't he?" "The last we heard from him was a panicked message supposedly from Fort Rannick. Which by the way has been stormed and taken by the local ogre clan." "Oh the Kreegs? I've heard about them." Emily tells her story about finding the house. "I saw a great big lumpy thing lumbering about and backed off, unfortunately I backed off straight into a pit. I pulled myself off a spike I managed to land on, but my leg was broken and I couldn't get out. A few hours later I heard a skirmish, and then saw a great big pillar of smoke. "That was us," says Troll. "Hey, "Wanna see a tree?" The party help Emily to her feet and return to the burning house. They hear and feel the heat before entering the clearing. The rangers still stand outside, reporting that nothing has exited. "Can you still hear it?" asks Arrian. Jakardros has his hand on the ground. "Yeah it's still there, bashing away." "Anyone know how to make damper?" Emily says with a cheery grin. Rowaine walks around the house's circumference, uttering a solemn prayer. The party stay to watch the house burn and look out for the tree-thing. About three quarters of an hour later there is an amazingly huge smash and a euarrgh, followed by another huge smash. Troll and Shalélu get on the Disc and fly around the house at 50 feet altitude. The roof is now largely open, allowing a view of the top level from the air. Timber and splinters fly at the rear of the house and they see something burning shamble out. It makes a straightline run directly away from the burning house, setting the underbrush alight. Troll circles back and tells Arrian and Rowaine. Together they decide to let it escape. The rangers don't think a walking tree with teeth is natural, but accede to the party's will. The path the tree-thing ran away on quickly stops burning. It has been raining a lot, mostly at night - the woods are quite damp. The party return to the cavern, expend their remaining healing, rest up and refresh spells. During the early morning hours Arrian chooses and casts Remove Curse on Troll, who then Identifies four of the six magical items. The amulet is an Amulet of Health +2. The white figurine is a Varisian Idol, granting any summoned monster +2HP per HD. There is a Wand of Magic Missiles (CL3) with 44 charges and a Wand of Ray of Enfeeblement with 28 charges. Troll bends his knowledge of arcana to the remaining wand, pores over his memory of the the encounter with the matriarch, and manages to chance upon the correct trigger phrase for the Wand of Vampiric Touch - draining a charge in the process. 32 charges remain. Rowaine takes the amulet in trust, Arrian the figurines and Troll the wands. "We need to get to Fort Rannick," Arrian says to the rangers. "Can you take us there?" "We will support you in whatever way we can. You had better be careful because if there's anything like the number of Kreegs that we saw, it will be very tough." "Perhaps we should go back to Turtleback Ferry and warn them," Troll says. "I can go back and deliver a message," says Shalélu. "We've already warned them," rebuts Arrian. "That warning was about something unknown," argues Troll. "Now it is definitive." "I'll go," volunteers Kaven. "I don't mind going. Look, if you want me to tell somebody in Turtleback Ferry, I'll go. Who do I contact? The sarge, as I normally do?" "Go to the mayor," Troll replies. "Go to your normal contact and they will take you to whoever is appropriate," suggests Arrian. "That'll be the sarge," says Kaven. As Kaven packs his gear the others turn their thoughts to Fort Rannick. "I can sketch the place if you like," offers Jakardros. Jakardros begins by describing how to get there, talking of the fort as being built into a canyon wall. Vale takes over at this point and describes the fort itself in rather an animated way, relishing the description. He seems to have a flair for architecture. There is an outer curtain and a two-storey fort with a subterranean level and a series of caves. The caves are accessible from without the fort. "Is there any way we can spy on the fort?" asks Troll. "Well," thinks Jakardros, "there's the eagles' aerie…"
"Can the ogres fly?" asks Arrian. "Not in the eight years I've been a Black Arrow have I ever seen a flying ogre. The aerie is just to the south of the fort and they are our allies, or at least were. They probably helped in the raid. I hope they survived." "So we could go there?" asks Troll. "That may be your best bet. You may not be aware, ogres can see in anything - low light, pitch black, sunlight, anything. It's very difficult to catch a Kreeg unawares… But they may not be looking up. There is a passageway that leads from the aerie all the way into the fort. It is little more than a rift in the stone at the fort end, so the Kreegs may know about it. There are other ways into the fort… the caverns underneath, although you have to be careful of the shocker lizards in there." Emily's ears perk up at these words. "Shocker lizards?" "They are reasonably harmless, although they can be lethal in numbers. They are not much larger than your little friend there, and deep blue in colour. And yes, they create lightning that can give you a rather nasty shock." Kaven bids the others farewell and departs. The remainder saddle up on Harley and Discs and head for Fort Rannick via the river. The day progresses and grey clouds gather. The trail that follows the river southwest branches off to the southeast, scaling the foothills of the mountain range. Jakardros says that at this pace the fort is about a couple of hours away. There is only about an hour's light left of the day. The party follow the new trail. Half an hour later the woodland becomes stony foothills and daylight is waning. The rangers suggest a place nearby that they use for training, an area with a rock wall and some large boulders that have fallen some time ago. As the light fades the rain that has threatened all day begins to fall. Watch: Rowaine and Vale, Arrian and Troll and Jakardros and Shalélu, Arrian and Troll and Emily. Towards midnight, those on watch faintly hear a mournful pitiful heartbreaking howling sound coming from the direction of the fort. Troll and Arrian think it is a wolf, a suspicion that Jakardros confirms. "It sounds like it has lost its mate. A number of my brothers had wolves as companions. Wolves and badgers. Good badgers in these parts." The fort is about an hour's walk away in daylight. After whispered debate Troll and Arrian decide it is too risky to seek out the source of the sound. Morning breaks and the rain continues to fall.